As I continue working with my new bone china body and the monochromatic surface treatment I am really excited about the results I am getting. 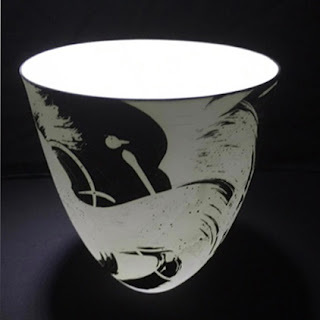 Just out of the kiln is this piece, whiter and more translucent than ever. I am so excited with these pieces and cannot wait for the next firings. It has been quite some time since my last blog post. One of the main things that have occupied my time is developing a new clay body. I have been working with Bone china for some time now and the kaolin that I used in the body was no longer available and as a result I have been busy with numerous tests trying to recreate the body I had. I opened a firing today and I am really thrilled with the result. If anything, I think it is better than the previous body I had. The translucency is exceptional as is the whiteness. To say I am happy is an understatement!